Posted: Thu Mar 13, 2014 10:03 pm Post subject: How early can I feed sugar water? It's still snowy here but had a few days around 10 degrees C. How early can we start feeding with sugar water?? Makes them poo if fed too early. Feeding honey is best, if you have your own. Second option is too feed luke warm sugar water beneath the combs but only in small amounts. In shallow warm plates/bowls. 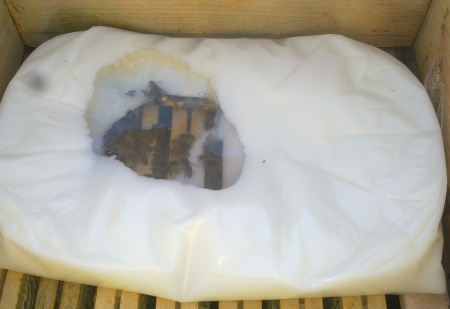 Third option is luke warm water in ziplock bags above the topbars, bees access it through a few small punch holes. The winter cluster sits right below the fondant, the wrapping is most important. 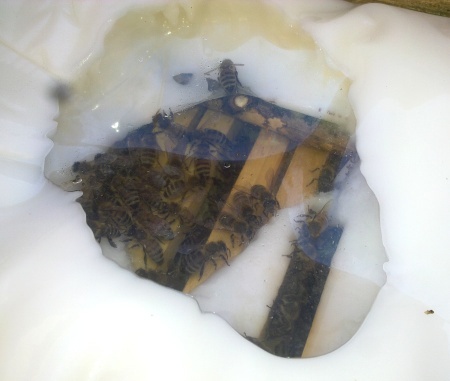 The bees access the dough from below through a small slot that runs across all topbars. First you see only a small hole that the bees eat. As you can see in the picture, the moisture laden air - bees are breathing! - condenses at the foil. Bees have food and water this way. This is nice. The fondant must not dryout, the foil is essential. 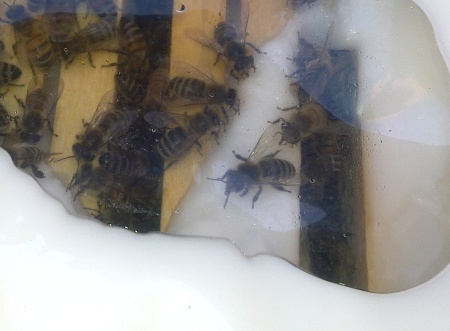 Bees eating through the fondant. Bees need about 4 kg food in Springtime per month. 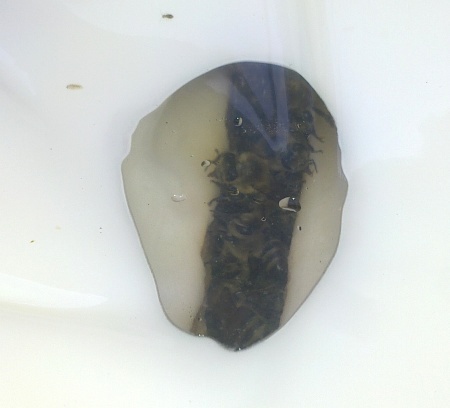 It costs a lot of stores to raise and warm the first brood. 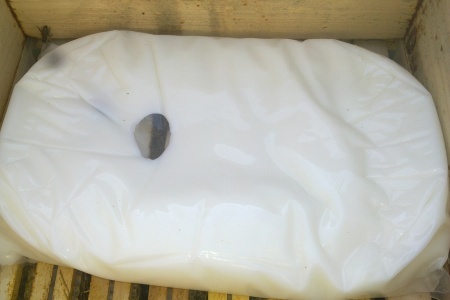 Bees walk straight from the combs into the bag. One more thing. The bag pools the warmth raising from the cluster. The warmth is essential for the bees to take the food at this time of year. Warmth is important. Winter feeding always is risky and best avoided by feeding in late summer, after checking stores regularily. You need one kilogramm of honey per winter month and four kilogramm per spring months. And a locally adapted bee that knows to winter.